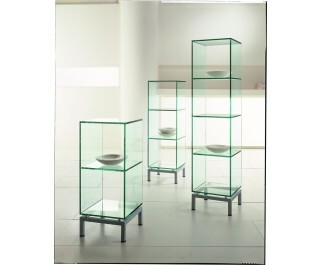 Showcase in float transparent or extraclear crystal gass with welded shelves. Available in 4 heights, on aluminium finish metal frame. They can be completed by door and back in tempered crystal. Only for cm 167 maximum height version. Latest model available with inside halogen lighting kit, to customer’s order.